A favorite past time of many is the collecting of Magic: The Gathering cards to unleash on a poor, unsuspecting soul at our local hangout. For those that didn't spend all of their lunch money on Magic cards, it is a game of fantasy using playing cards. By collecting "Mana" or land cards each turn, you will be able to spend that mana to unleash creatures and spells to devastate your opponent. Of course, it's more complex than that, but that is the gist of it. 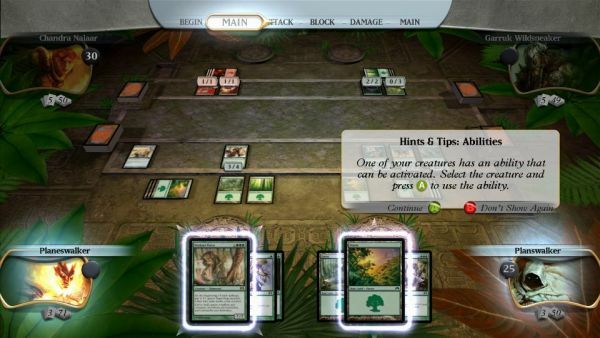 "Duels of the Planeswalkers features eight unique player decks, deck customization with unlocked content, single player and cooperative campaigns, ranked and unranked online single player and cooperative play, leader boards, and more!" Of course, since we caught the "Co-op campaign" mention in this game, we'll just have to give you the whole story in review form after we play it! Page created in 0.5860 seconds.